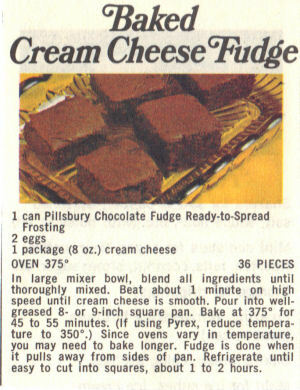 This promo recipe from Pillsbury was clipped from a recipe sheet or maybe a magazine and was found in a large collection, date unknown. I’ve typed it below along with a scanned copy. In large mixer bowl, blend all ingredients until thoroughly mixed. Beat about 1 minute on high speed until cream cheese is smooth. Pour into well-greased 8- or 9-inch square pan. Bake at 375° for 45 to 55 minutes. (If using Pyrex, reduce temperature to 350°.) Sine ovens vary in temperature, you may need to bake longer. Fudge is done when it pulls away from sides of pan. Refrigerate until easy to cut into squares, about 1 to 2 hours.